If adding an outdoor water fountain to your garden has not yet crossed your mind then you truly are missing out on an aesthetically pleasing and very versatile addition. Most people conjure images of extremely large fountains with cupids or Greek gods and/or goddesses. This is an out of date conception, garden fountains need not be like this anymore. Garden water fountains come in all shapes and sizes, small fountains can be attached to a wall or a simple device placed in a bowl, larger fountains can fill corners, liven up a walkway, be an accessory on your deck, or your gardens centerpiece. So why would a person want to spend extra money on a modern fountain? There are quite a few reasons actually. If you really want your garden to be aesthetically pleasing, then nothing can help to do this better than an outdoor fountain. The sound of flowing water contributes greatly to a gardens sense of serenity, having a calming effect. Even if your yard is not beautiful, or you have no interest in doing the work necessary to design one, ready-made outside fountains make for an effective alternative. You can place them centrally to draw everyone’s immediate attention, or you can place them somewhere off to the side, providing a soothing periphery that will liven surroundings. There is a wide array of different styles and materials available to you when it comes to outdoor fountains and this incredible array simply makes it even more customizable than you may ever have imagined. First and foremost you are going to want to put consideration into the size of your garden. If your yard is rather large then you are going to want to choose a rather large fountain to complement it with, for example. If your yard or garden is smaller on the other hand then you are going to want to choose something like a small patio fountain otherwise you may end up dwarfing an already small space with a feature that is simply too large. If your yard is really, really small, then a wall fountain may be the best option because it will not take as much space up and will let you use your precious real estate for other purposes. if you do not like the ideas of electricity near water then a solar powered garden fountain would be a good choice. The other consideration that you are going to want to make pertains to the style of the fountain that you want to implement in your garden space. You are going to want to choose either a contemporary fountain based on the furniture you have or choose the furniture based on the style of the garden fountain that you have. 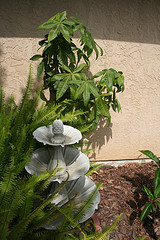 Make sure that your fountain is compatible with your décor on an overall basis for the best possible results. This is especially going to be true when it comes to the plants that you are going to be using in order to surround your fountain. When using a floor fountain, taller is generally the better way to go with your plants.